Every student of Food Science and Technology or linking in the area of this branch can present their works. Oral communications have a duration of 10 minutes the presentation and 5 minutes for discussion and questions with the Committee and attendees. 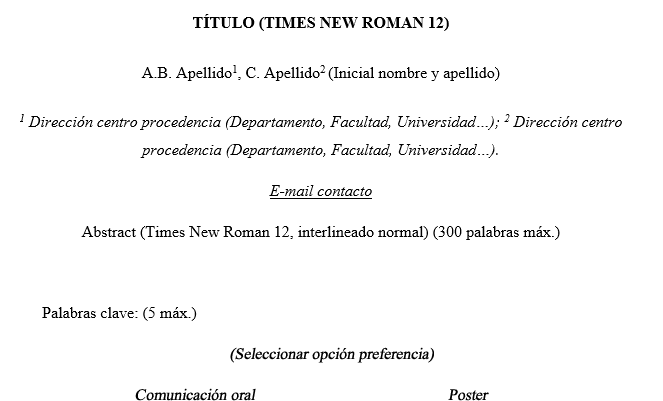 In the first slide will include the title of the paper, the authors and the university or center that comes. Posters must adjust to the following characteristics: 59cm. high by 84cm. wide. At the top of the order shall include: title and authors and university or center that comes. Can be used all kinds of graphics and font should be visible to two meters away. The deadline for sending us your abstracts is 5th February 2019 and deadline for finished posters is 14th February. The abstract is like a mini version of the research paper. We therefore must preserve the typical structure of a scientific paper (Introduction, Objectives, Method or Design, Results, Conclusions and keywords). An abstract is a single paragraph of less than 300 words, where the object of study, the methodology used, the results of research and the key findings are described. It is very important to be concise and well written. You can take advantage of the seminars you do during the course for this or another topic that be of your interest. Entries can be individual or in groups. It must allow the Scientific Committee to identify the basic content of document fast and faithfully , in order to determine its relevance to the Congress, based on what will decide whether it will participate as an oral or poster. In case of doubt do not hesitate to contact us. All oral presentations and posters will be evaluated on the congress by the scientific committee that will decide the winners. The awards ceremony will take place at the Closing Ceremony on Friday.